Art Dubai’s new segment UAE NOW explores the evolving landscape of the country’s independent artist-run platforms that add an essential layer to the local art ecosystem. 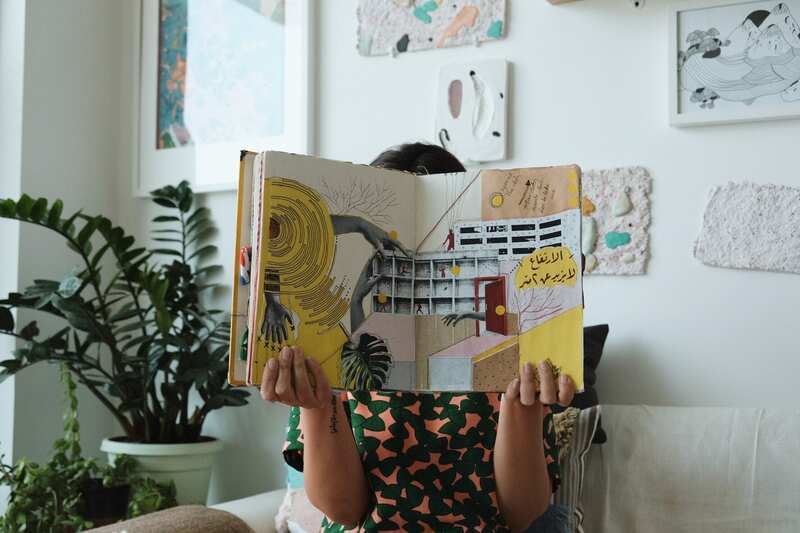 Amongst the participating platforms is Daftar Asfar, literally translated as “Yellow Notebook”, founded by Sarah Hatahet, Lena Kassicieh and Nahla Tabbaa after being inspired by Brooklyn Sketchbook Library in New York. Moving from city to city, this sketchbook concept invites artists to interact and create a collection of artworks within its pages, allowing artists to further their own practice whilst connecting and interacting with other artists, often not met before. How did the idea of Daftar Asfar come about? What was your inspiration? 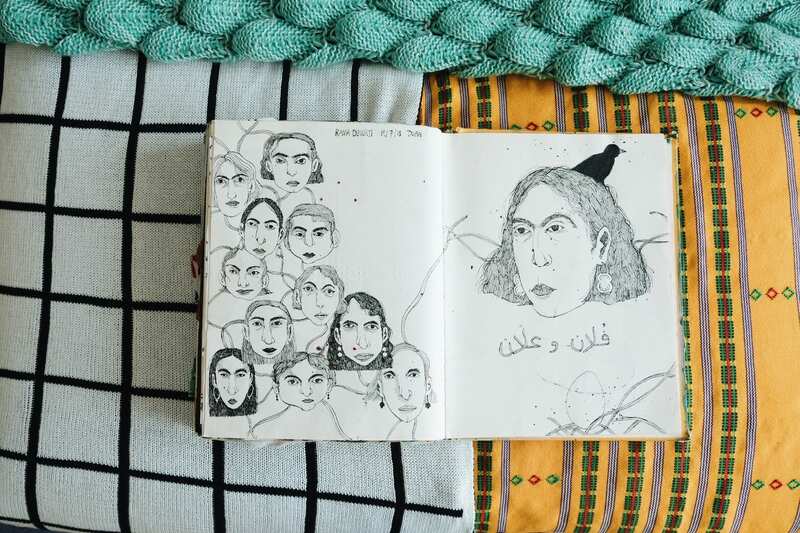 Daftar Asfar: Nahla shared a story on social media about a library in Brooklyn, New York filled with artists sketchbooks from around the world. We then took this idea as a starting point, and decided to start a series of sketchbooks that would feature the collective, collaborative work of tens of hundreds (eventually…!) artists from around the region. Our hope was that one day we could build a library or archive for these pieces, along with cataloguing the process and story of each sketchbook. Collaboration seems to be a big part of the ethos of the project, can you guys elaborate on why that is? Is this something you did on purpose? You’re all Arab women from the region. How do your identities influence your work and this project in particular (if at all)? Lena: When we first started Daftar Asfar, we had a conversation about what regions and artists we wanted to work with. We wanted to be accessible and open, but at the same time, really felt a pull to keeping it within the West Asia-North Africa context – partially for logistic reasons, partially because there are not many similar platforms regionally. It’s been so wonderful seeing how different artists choose to experiment in the book, and I don’t believe that identity is an isolated experience…where you grow up doesn’t necessarily define your identity. It’s an exploratory process that is constantly molding, changing; identity is not stagnant, nor is it necessarily defined by where you live or what nationality you are. Nahla: Identity and inviting artists strictly from our region (the Arab World) was a back and forth discussion between us, which I often rolled my eyes at because it is incredibly challenging these days as Lena said, to see our identity as one isolated experience. We have two artists from Pakistan who contributed, another from Armenia, another from India and whilst we hoped for the book to be contained within the MENASA region I don’t think it would do the book justice to explicitly make decisions based on national identity. I see Lena and Sarah as friends, professionals and collaborators, far before I see them as Arab women from the region, and my choice to work with them was based on our shared passion and dedication to the project. Sarah: I think my identity as an Arabic speaking, Arab woman artist who lives and works from Amman, highly influences my work and my contribution to Daftar Asfar. As Lena and Nahla said, we did have many discussions on where this books should be focused, but our decision to keep the first edition local, to a region, came mainly as a celebration for the art scene we are embedded in. We said in the beginning that the idea came from a N- based sketchbook library and we felt that there is a gap in our region that needed to be filled. There are so many artists we watched grow and blossom in Amman for example, that did not get the chance to exhibit or show their work outside their city, these artists create work woven directly from the city which they call home. follow the halo is a digital zine that supports visual arts from the middle east and beyond. Every month, it releases an issue around a theme – past issues have explored themes of diaspora, coming of age, and empowerment – accompanied by a commissioned work created in collaboration with an emerging artist.